In the life there is new hopes, new opportunities, and new challenges to every individual. Start the day with kind words and best wishes for a prosperous good day, will make a smile to anybody’s face , and then they get encouragement and confidence to do their work. We can be wish for good day wishes among friends, relatives and colleagues, that come truly from one’s heart to wish others to have a good day. Here we have a collection for good day wishes to wish your near and dear one , to wish your family , to wish your loving husband , wife , boyfriend, or girlfriend, to wish your best friends, colleagues etc. By sending them these wishes you can make their day emotionally joyful. Dear,Welcome a fresh day with a smile and gratitude in your spirit. With a prayer and with a lot of my love. Most beautiful thing is to see a someone smiling and more beautiful is knowing that you are the reason behind it. Be a reason for others to smile. It’s not the presence of someone that brings meaning to Life. But the way Someone touches your Heart gives life a beautiful meaning. 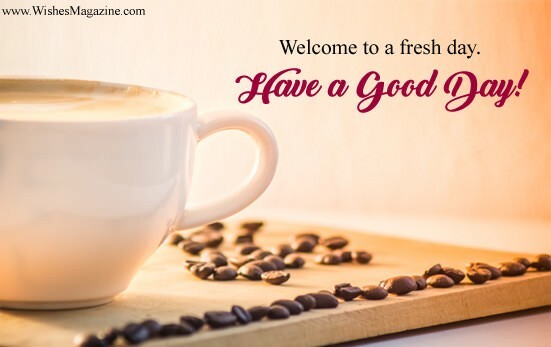 Welcome to a fresh day with a smile on your face.Have a good day! Don’t work too hard to give yourself the best of everything, instead make a greater effort to give God the best of yourself. Get up and make the best of today.Wish you good day & Good Morning. Dear Friend,We ne’er have what we like we never like what we have still we live,Hope that some day well get what we have thats life . Have a great day which is full of joy, love and happiness. Wish you good day & Good Morning. Hard work is like steps and luck is like a lift,Lift may fail sometimes but steps will always get you to the highest. Greatest value of having good people around you isn’t what you get from them,but the greater person you become by being with them. Confidence comes only naturally with success but success comes to those who are confident.So make your day with full confidence. Have a Good Day. Every day has a different shade and colours. May your day is blessed and have a good day with new dreams and hard work. My good wishes is with you , May you have a wonderful day and happiness and new energy for new project .Have a good day.